I had a chance last week to drive through some of the sections of the New Jersey Pinelands that have been devastated by Gypsy Moth Caterpillar damage this spring and summer. I lived and worked in the Pinelands for 5 years and have visited them regularly since the early '90s. This is the worst damage I have seen in that time. 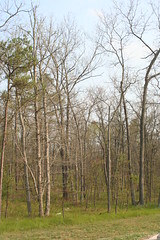 In many areas, the forest canopy looks similar to its winter condition, with the oaks bare of leaves. When you get a closer look, you realize that there are tiny bits of leaves left on the oaks and even the pines have some needle damage. The gypsy moth caterpillars have eaten every green thing in their path. The lack of leaves in a forest in the middle of the summer is eerie and leaves you with a feeling that there has been some kind of industrial accident that affected only the oaks. There is a controversial spraying program to try to combat the pests and some homeowners have supplemented the state's aerial spraying program by spraying their own properties. You can see the places that this was done and they stand in stark contrast to the vast swaths of natural destruction left behind by the ugly little eating machines. I'm not a botanist, but I can't imagine that the forest can easily recover from the damage. My guess is that many of these tress will die. That will add to the already high fire danger in the Pinelands due to the recent dry summers. Some have said that the application of Union Carbide's Sevin brand of pesticide in substantial amounts applied from the air might have stopped the damage this year. The Department of Environmentl protection also rejected the use of the pesticide Dimilin as well. Instead, the state applied the less-controversial, but less-effective Bt. Tempers have flared. I've got to say that i don't like the idea of large-scale aerial sprays of toxins over populated areas. But I think that you have to weigh the relatively small risk of the use of such chemicals versus the very real risk that the entire Pinelands area could be lost over the next several years. I think we've got to look hard at these pictures and make some tough choices before next spring. I'm leaning toward spraying Dimilin more widely, but I am open to hearing other viewpoints.